"Every boy needs a mother...even if Dad has to marry her!" Who will be the next Mrs. Corbett? Will it be the chic designer? The Miss Montana Pageant hopeful? The headstrong lady across the hall? It's a big decision for any boy to make for his recently widowed dad! Like father, like son. You'll like'em both when Ronny Howard portrays Eddie and Glenn Ford is his dad. Vincente Minnelli directs. Shirley Jones, Dina Merrill and Stella Stevens portray the prospects under Eddie's self-appointed scrutiny. 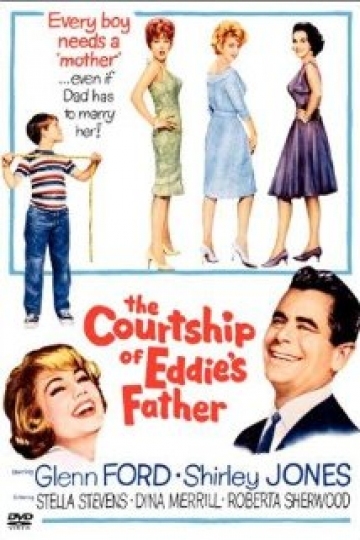 The Courtship of Eddie's Father is currently available to watch and stream, buy on demand at Amazon, Vudu, Google Play, FandangoNow, iTunes, YouTube VOD online.